What’s new in your area? What can we do that’s different? How can you provide an experience? Those are the types of questions I get when I go to a trade show and meet face to face with tour operators looking for “the experience” for their groups. The Marion Area Convention & Visitors Bureau has cultivated a number of relationships to help in the “unique experience” opportunity. 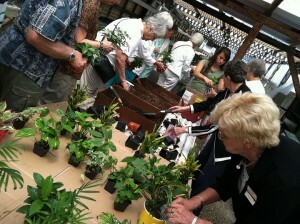 Marion Flower Shop recently offered a hands-on opportunity for our bus groups. Pick a colorful pot, pick a plant, add some extra dirt, some moss on top and give the plant a drink of water. There you have it, each person of the tour group walks away with an experience and a plant that will remind them of their day in Marion, Ohio. Marion Flower managed the larger groups by splitting them up between the gift shop and the hands-on opportunity and then shifted as the visitors completed the activity. This also gave the group ample time to shop for additional gifts. Robotworx is a unique factory in Marion. They recondition robots for new uses. They have even had robots used in a couple of Hollywood films as well. They have allowed the CVB to offer their facility tour to a few of our groups. After their tour the groups were amazed at their experience. The great plus to this tour was a gentleman on the tour discovered he may be able to take this information back to his employer for further research. It may not be a hands-on opportunity, but it is still very interesting to see the bots in action. We will be offering this opportunity to more groups in the future. The CVB has worked with The Marion Historical Society director, Gale Martin, to continue the Dinner with the Presidents experience to groups on a smaller, more intimate level. Gale was open to making it happen whenever we had a group request the experience but couldn’t make the day she had set. We are trying to work the kinks out so it would be an ongoing experience that could be on request and not just at one time each year. Catering to the needs of the groups could be a benefit to a local facility. Could your facility offer an experience for a tour group? Could you handle anywhere from ten to 55 visitors through your place? Give the Marion Area Convention & Visitors Bureau a call and we can do a walk-thru, some brain storming and see if we can make something unique happen. Our planning includes many of the same things you would normally think of that Marion is famous for, but we want groups to come back more than once to experience new things or something that has a new twist to it. We are cultivating experiences that will make them feel right at home! Diane Watson, Director, Marion Area Convention & Visitors Bureau, 1713 Marion Mt. Gilead Rd., Suite 110, 740-389-9770. www.VisitMarionOhio.com.